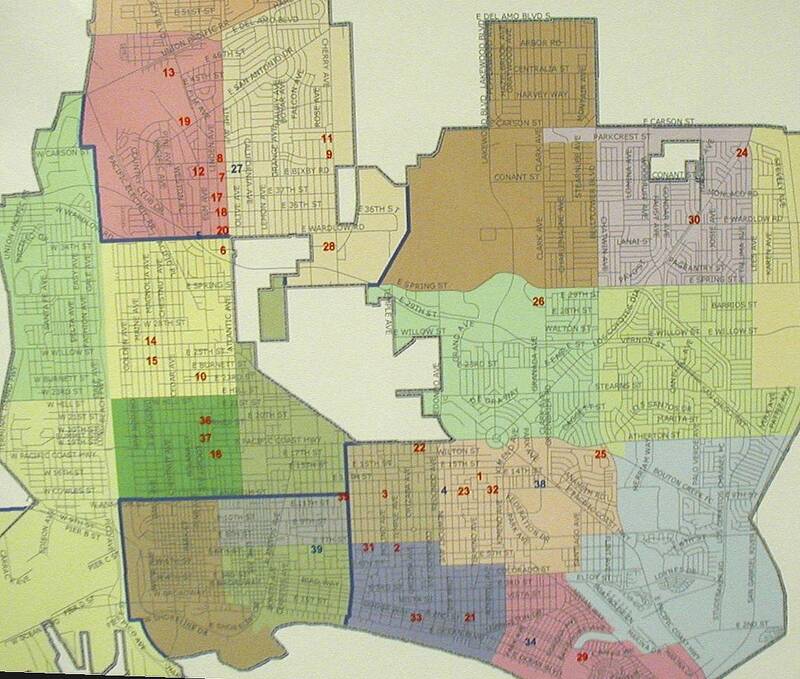 (January 19, 2005) -- LBPD has told a specially-called community meeting that since late October 2004, there have been 33 "window smash" commercial burglaries plus six safes taken from businesses in parts of central LB, Bixby Knolls and East Long Beach. 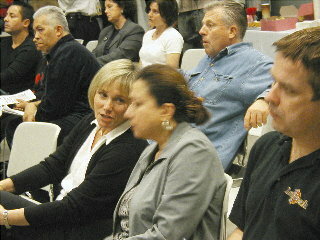 Roughly two dozen concerned business owners -- some of whom had already been victimized -- attended the January 19 "Business Awareness" meeting held by LBPD at the Water Dept. auditorium. 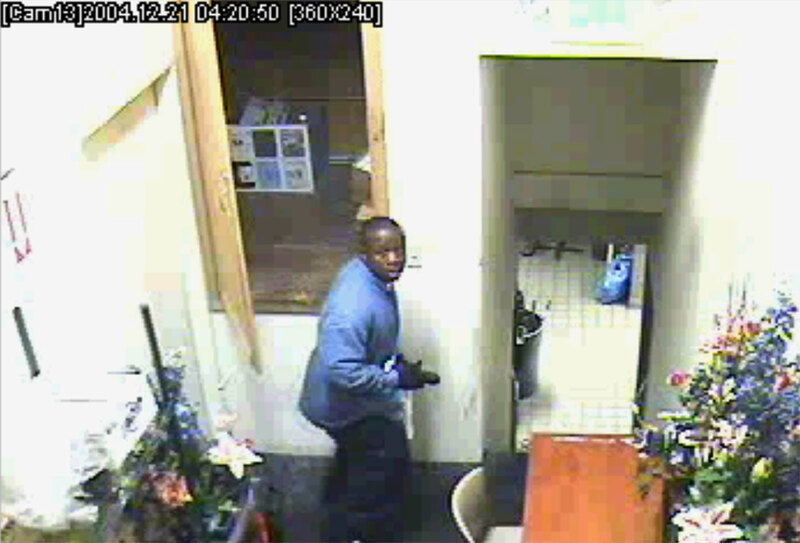 LBPD released a color photograph (below) of a Dec. 21 commercial burglary in progress...and indicated that this suspect is only one of what may be multiple suspects. "There are at least two different sets of suspects descriptions that we have, at least a minumum two different groups that are commiting these crimes. Are they related to each other? We can't tell you "yes" right now, but there are at least from the descriptions we're getting, there are different sets of suspects who are commiting these crimes," Deputy Chief Robert Luna said. 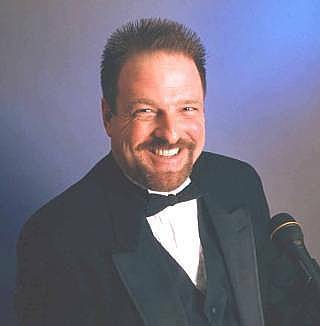 Vincenzo Cristiano, founder and owner of LB's oldest Italian restaurant, Nino's (Atlantic Ave. at Roosevelt Road), was one of several Bixby Knolls business owners hit by the burglaries. LBPD said apprehending the culprits is a top priority. "We have flexed two specialized units to graveyard [overnight] hours. There's more emphasis in patrol about getting this information to them, getting a hold of the com center to make sure that any calls related to suspicious people, broken windows or anything that could be related to any ot these burglaries going on is dispatched as a Priority One," Deputy Chief Luna said. "We also have additional officers on overtime, and if this continues we're going to increase that," he added. LBReport.com was first to report in December on a number of "window smash" commercial burlgaries in the Bixby Knolls area. Since then, they've extended into parts of East and Central LB. "If anybody sees anything suspicious, around any business or around any location, whether you're a business owner or a citizen, give us a call," said LBPD Public Information Officer Israel Ramirez. 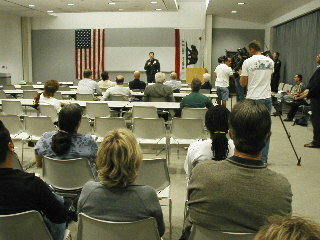 LBPD encouraged businesses to maintain good lighting and security systems. 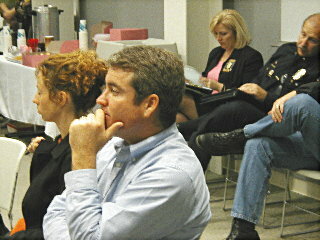 Among those attending was Councilmember Patrick O'Donnell and chief of staff Melissa Infusino. Councilmembers Rae Gabelich (8th dist.) and Tonia Reyes Uranga (7th dist.). Attending but not shown in this photo, Council office aides Tim Patton (5th), Ray Pok (7th), Jonathan Kraus (8th), Dan Pressburg (9th). 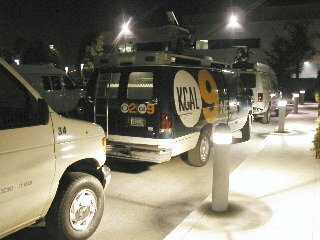 The meeting drew a number of L.A. media outlets. We counted six television stations. 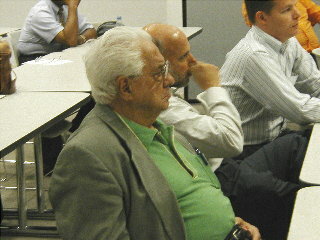 Fox 11's Ed Laskos talks with a member of the audience. 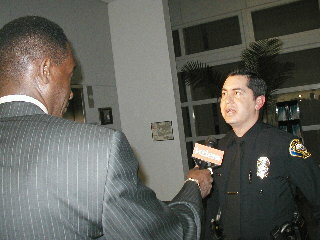 LBPD Public Information Officer Israel Ramirez was kept busy with one interview after another. 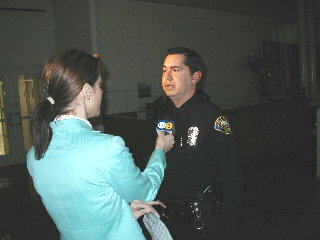 First with KCBS 2/KCAL 9. 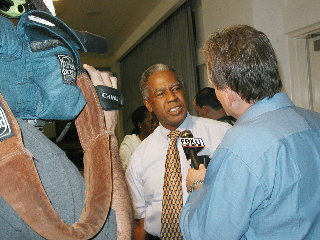 Then KTLA 5's Walter Richards.